Scientists have been experimenting with brain-to-brain interfaces for years. Miguel Nicolelis, a neurobiologist at Duke University Medical Center, in particular, has been making strides with his research on the subject. His team recently created a "Brainet" or a network of interconnected brains with four rats. With microscopic electrodes implanted directly in the cortex region of their brains, each rodent exchanged information with the other in real-time to create an organic computing device. Collectively, they were able to solve computational problems including image processing, storing and recalling information and even predicting precipitation. Nicolelis first studied connected brains with three macaque monkeys who were assigned the task of operating the arm on a virtual monkey. 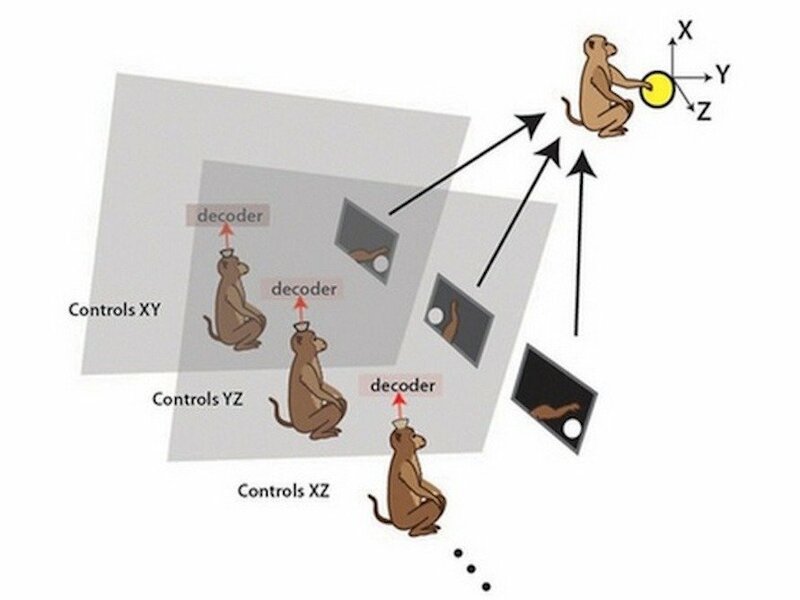 Each animal sat in a separate room but their brains were hooked up to one another so they could exchange information based on their respective views -- each monkey faced a computer sceen. Through a series of experiments and combinations (the researchers tried pairing two monkeys or grouping all three together), the animals were able to collectively move the arm to an assigned target. For each successful task, they were rewarded with juice. Over time and practice, the animals achieved greater coordination and synchronicity. The researcher then explored the idea of a "superbrain" and experimented with a pack of rats. They worked in pairs, so when one set solved a problem, their brain activity was relayed to the other pair through electrical stimulation. On receiving the electrical clues to solve the problem, the second pair found it easier to complete the task. The interconnected group of rodents learned to recognize brain activity patterns to complete the tasks and they synchronized their activities when given a particular stimulus. In one particular test, they received electrical stimulation that was linked to an increase or decrease in the air temperature and pressure. Based on those cues, the group was able to predict the chance of rain with 41 percent accuracy. The demo concluded that the rats achieved better and faster results than they would individually. One of Nicolelis' most fascinating observations was that the rodents figured out a way to divide their workload among the group so one wasn't bogged down with more work than the other. The demo serves a tool to study social behaviors among animals, but it also reveals the potential of organic computers for human brains. The scientist believes this computing device could eventually help stroke and epilepsy patients. For now his team is working on finding a noninvasive way to create a human Brainet.